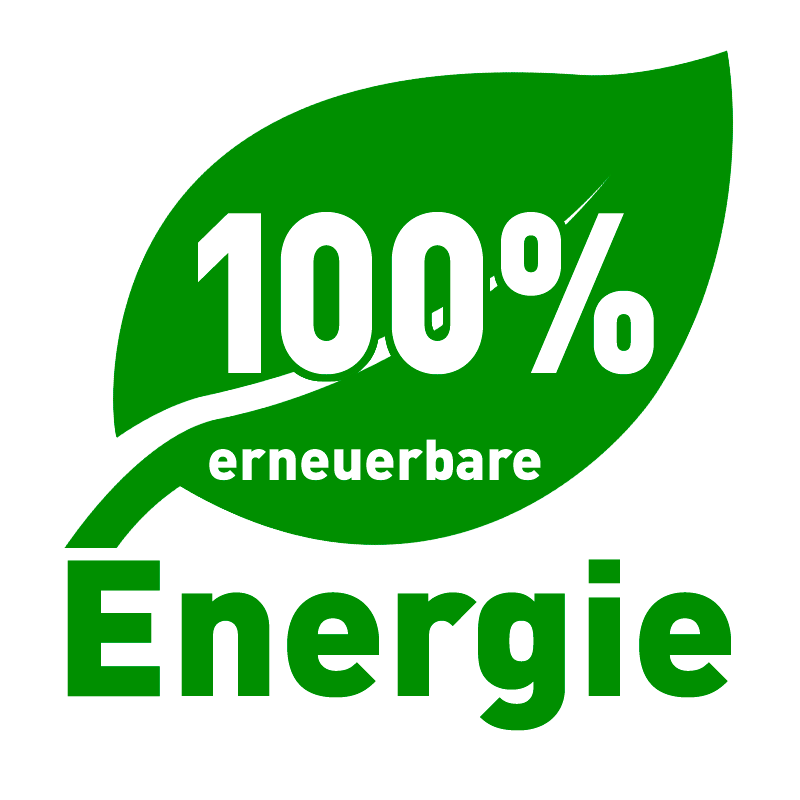 We operate your servers with renewable energy in ISO-certified high-security data centers in Frankfurt am Main (Germany). Your servers, applications and data. Our managed server and web hosting solutions with round the clock support offer security and accessibility for your applications and data. After analysis of your requirements, a tailor made web hosting solution is developed to meet your needs and your budget. From the initial analysis, planning, development and operation right through to replacement or termination, ITIL compliant service management, carried out by certified personnel, is available on request. Scale according to your requirements, from a single server to accessibility and performance clusters, to your own private cloud, geo redundant solutions using multiple locations are available on request. As part of PaaS we offer a range of operating systems including LAMP and Tomcat Server, Linux, BSD and Windows. We offer Software as a Service (SaaS) for established software such as RT, JIRA, Confluence, Kolab and Exchange and also for the operation of proprietary software and applications. All solutions and offers are fully supported and a comprehensive individual Service Level Agreement is available on request. We can manage the partial or complete operation of your key IT infrastructure, including all administrative work, local data centres, location networks including encryption and supervision and redundant and secured external connections for data centres and locations throughout Germany. Whether we are operating with your proprietary infrastructure and server on site or at our locations: we apply the same high security requirements in accordance with ISO 27001 and ITIL. SSL offloading on the load balancer, available on request, gives you the option to distribute requests between several server systems. Set up with increased accessibility and security with continuous redundance. Geo redundancy through the parallel operation in two separate data centres to meet the highest standards of security, accessibility and data integrity. We offer data hosting for your data and servers in specially chosen, modern ISO certified high security data centres. Our headquarters in Frankfurt am Main is directly linked to DE-CIX, AMS-IX and ECIX – Europe`s largest internet exchange for optimised packet runtimes in the important German and European networks and carriers. Comprehensive certified high security data centres in Frankfurt am Main, including certified operation and management in accordance with ISO 27001 “IT security” ISO 22301 “Business Continuity”, ISO 9001 “Quality Management” PCI DSS Payment Card Industry Data Security Standard, SOC2. 24/7 surveillance including on site security staff. The latest air conditioning, power engineering and security systems. Security and accessibility due to the purpose built complex. Directly connected to Europe’s largest Internet exchanges DE-CIX, AMS-IX and ECIX. Our presence in Europe’s largest Internet exchanges DE-CIX, AMS-IX and ECIX, together with a sophisticated routing policy involving tier 1, tier 2 and tier 3 carriers, allows us access to all of the important European IP Networks via at least 2-3 independent routes. With over 890 direct peerings and route server peerings, our IP Network is one of the best networked when compared with other providers in Germany. 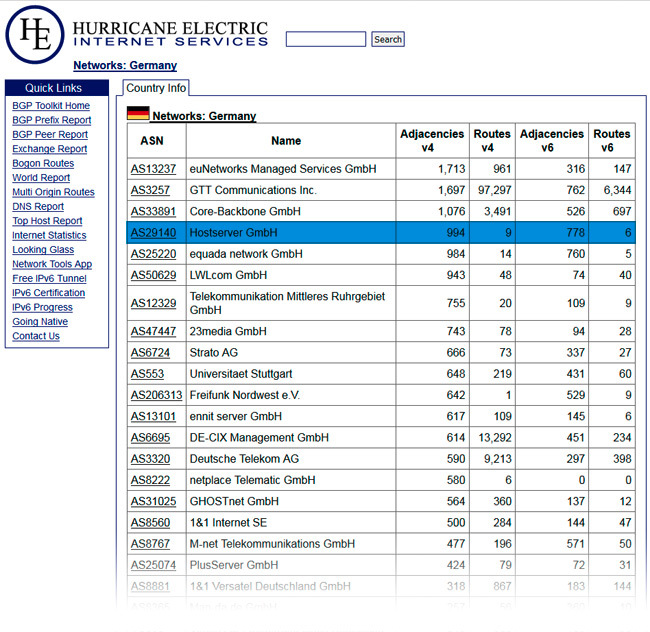 (Source: Figures according to Hurican Electric HE), as at June 2016. Companies who demand the highest standards choose our servers and web hosting solutions due to their reliability and speed. Haufe-Lexware is Germany’s leading media and Software company for specialist information, (cloud computing) applications, eProcurement, Online communities as well as personnel development and organisational development. Haufe Group’s main target group is large and medium sized companies, small businesses, freelancers, tax advisors and lawyers and the public sector as well as real estate companies, and associations. 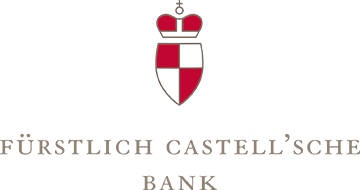 As a medium-sized company, the „Fürstlich Castell’sche Bank“ operates with 17 branches in Southern Germany and has been rooted in the region for centuries. LucaNet based in Berlin is a specialist supplier of fully integrated financial software solutions for consolidation, planning, reporting and analysis. LucaNet has an international presence in Austria, Switzerland, the Netherlands, Belgium, France, Ukraine and China. Renowned companies from various branches such as Condor, Edding, Langenscheidt, Peek&Cloppenburg, Tom Tailor and Toshiba deploy the solutions and offers from LucaNet. Setlog is a specialist supplier for online based supply chain management solutions which are deployed by renowned manufacturers and brands around the world. With a customer base of around 400 000 payment terminals, ConCardis GmbH is one of the leading suppliers for payment transactions with debit and credit cards. ConCardis is authorised by the German Federal Financial Supervisory Authority as a payment institute and provides secure and simple to set up payment solutions for retailers, service providers, and internet and mail order businesses. Hostserver GmbH is a supplier of individual managed web hosting solutions and IT projects with special focus on IT security, quality, compliance and data protection. 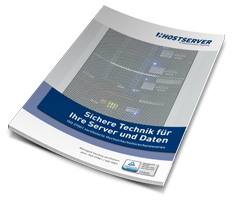 Hostserver GmbH is one of the few companies in the world to be certified in accordance with DIN ISO/IEC 27001 and DIN EN ISO 9001in the core processes name service, domain service, managed hosting and customer support. ISO 27001 is the leading international standard for Information security. 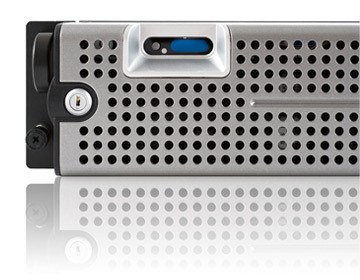 Hostserver has been certified since 2012 in accordance with ISO 27001. The certification includes the core processes managed hosting, domain and name service as well as customer support. ISO 9001 is the international standard for quality management systems. Hostserver has been certified in accordance with ISO 9001 since October 2011. The certification included the core processes managed hosting, domain and name service as well as customer support. Our internal control system is audited annually by a certified public accountant. 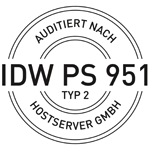 IDW PS 951 audited. In doing so, we meet even the demanding requirements of listed companies and banks when outsourcing business processes. Our service managers are certified and certified according to „ITIL v3 Foundation“. ITIL stands for „IT Infrastructure Library“ and is a best practice collection for the organization of an IT service company. Internationally, ITIL is now considered the de facto standard for IT service companies. Comprehensive data protection and individual contract data processing simplify the use of our services in the field of business and enterprise. For a non-binding consultation and a first price indication for your IT project with your requirements contact us in writing or by telephone.